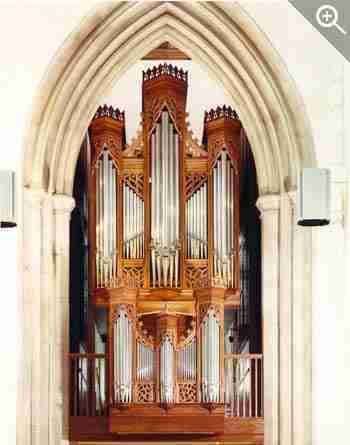 Chelmsford Cathedral has the distinction of being the first Anglican Cathedral in England to commission a new organ for some three decades. All the more remarkable therefore that they commissioned not one, but two new instruments, the Chancel organ being described on the next sheet. The Nave Organ was built on a specially constructed gallery at the west end of the Cathedral. Interestingly, when the new gallery was constructed, evidence was found that a similar gallery had existed previously, and there remained indications that a door had been blocked up from the spiral staircase now used to gain access to the gallery. The style of the instrument is based on the work of the finest English builders of the mid nineteenth century, most notably Gray and Davison. The casework is to our own design and based on the work of the notable English organ builder and artist, Arthur Hill. The organ has four manuals and forty stops. It is the third four manual organ we have built in as many years and like the other two, the key and pedal actions are entirely mechanical, including all the couplers, the drawstop action being electric with a full complement of registrational aids. A 40-stop organ may be seen as relatively small to warrant a four manual console. The forth manual is in fact dedicated to just one stop. However, by doing this it was possible to add flexibility, and the Ophicleide is also on a higher pressure. The space available for the organ was in fact rather limited. This dictated that the Swell Organ be placed behind the Great Organ, and the Pedal Organ is contained in two separate cases either side of the main case and hardly visible from the Nave. The Great, Swell, Solo and Pedal Organs are all playable from the console of the Chancel Organ, which has a third manual to make this possible. The swell pedal remains mechanical when used from the Nave Organ console, although an electric swell action engages when the organ is being played from the Chancel console. 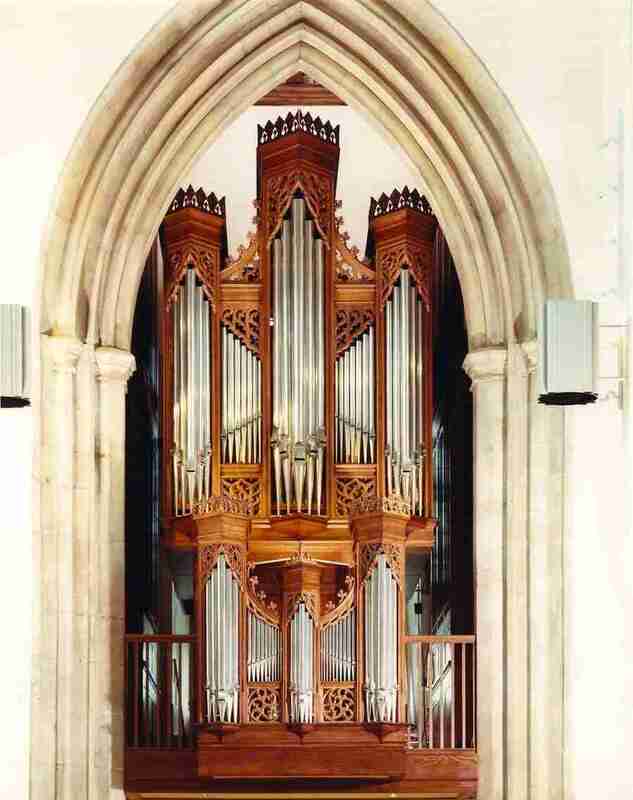 The organ has become a pivotal ingredient in the annual Chelmsford Festival.